Our next meeting will take place on Sunday 30 October at 11am at Kings Theatre Creative, Kawakawa. 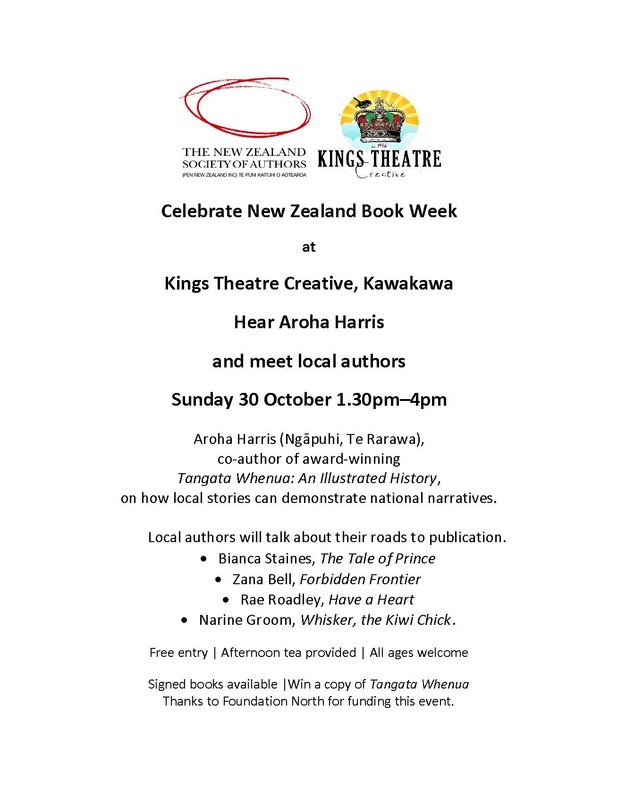 This will be followed at 1.30pm by our New Zealand Book Week event, featuring Aroha Harris. This month we encourage you to support New Zealand Book Week by reading a book by a New Zealand writer. Support your local library or independent bookshop. 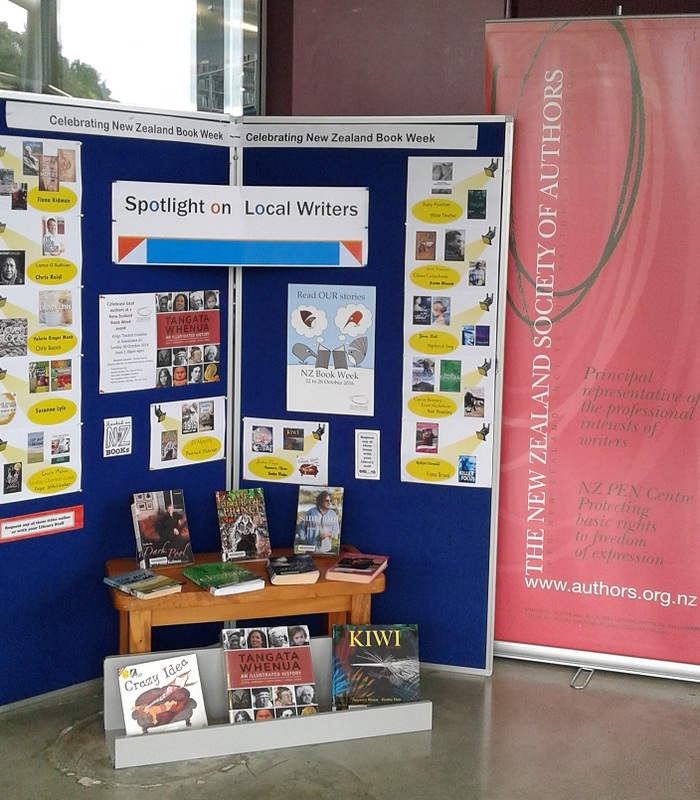 The Procter Library in Kerikeri has put together a display of books by local authors to make it easy for people to find a title in their preferred genre. Look out for the display we are mounting in the Proctor Library window during the last week of October. Rae Roadley has published a novel, Have a Heart, on Amazon https://www.amazon.com/dp/B01JFBG4N6. The Omahu and Gunn families have been in conflict ever since Jack Gunn’s ancestors ‘stole’ Glory Omahu’s family land. Now Glory and Jack are back in their New Zealand coastal hometown with very different goals. Can love overcome generations of mistrust, a clash of cultures and stolen family treasures? An excerpt was highly commended in the Northwrite competition and is available to read here. We would like to encourage members to discuss their books on this site. You can have one book (or one series of books) featured in PenNorth (until all members have had an opportunity and then you are welcome to feature another one) which will also be displayed on our Books page here. Descriptions should be kept to around 200 words. If you are interested, please send an image of the cover and your description to Kathy or to northlandauthors[at]gmail[dot]com. Remember this is your forum. If you would like your book featured then please let us know. The Mangawhai Museum is holding a Creative Writing Workshop with Lynne Dawson on Saturday 29th October. Cost $10. Includes morning tea at 9.45am and lunch. Workshop 10am–12 noon, Lunch, Workshop 1pm–3pm. For more information or registration please contact Emma, phone 09 4314645. Numbers are limited.